The Last Supper was painted upon the wall of the monastery alU Grazie, at Milan. The place where the picture is painted must first be considered, for here the skill of the artist appears in its most brilliant light. What could be fitter and nobler for a refectory than a parting meal, which should be an object of reverence to the whole world for all future time. Several years ago, when travelling, we beheld this dining-room still undestroyed. Opposite the entrance on tbe narrow side, stood tbe table of tbe prior, on both sides of bim the tables of tbe monks, all of which were raised a step from the floor and when the visitor turned roand, he saw painted on the fourth, above the doors, which are of but mod- erate height, a fourth table, and Christ and his disciples seated at it, as if they belonged to tbe society. At meal times it must have been a telling sight, when tbe tables of the prior and Christ looked upon each other as two opposite pictures, and the monks at their places found themselves enclosed between them. And just on this account the skill of the artist was compelled to take the existing tables of the monks as a pattern. Also, the table-cloth, with its folds still visible with its worked stripes and tied corners, was taken from the wasb-room of tbe monastery. The plates, dishes, cups, and other vessels, are like those which tbe monks used. Here was no attempt at imitating an uncertain antiquated costume ; it would have been highly improper to stretch out the boly company upon cushions in this place. No, tbe picture roust be brought near to the present; Christ must take his lost supper with the Dominicans at Milan. Also, in many other respects, the painting must have produced a great effect; the thirteen figures about ten feet above the Boor, onehalf larger than life-size, take up the space of twenty-eight feet in length. Only two whole figures can be seen at the opposite ends of the table, the rest are half-figures ; and here, too, the artist found hia advan- tage in tbe necessity of the circumstances. Every moral expression belongs to the upper part of tbe body, and tbe feet in such cases are everywhere in tbe way. The artist has created here twelve half-figure«, whose laps and knees are covered by tbo tabic and table-cloth, but whose feet arc scarcely visible in tbe modest twilight be- neath. Let us now imagine ourselves in tbe place ; let us consider the moral repose which prevails in such a monastic dininghall, and let us admire the artist who lias infused into his picture, powerful emotion, passionate movement, and at the same time has kept his work within the bounds of Nature, and thus brings it inclose contrast with the nearest reality. The means of excitement by which the artist arouses the quiet boly group, are tbe words of the Master : “ There is one among you who shall betray me !’* They are spoken—the whole company falls into disquiet; but he inclines bis bead, with looks cast down ; the whole attitude, the motion of the arms, of the hands, everything repeats with heavenly submission tbe unhappy words: Yes, it is not otherwise, there is one among you wbo shall betray me! Before we go fnrthcr, we must point out a happy device whereby Leonardo principally enliveaed his picture; it is the motion of the hands; this device, however, only an Italian could discover. With his nation, tbe whole body is full of anima- tion ; every limb participates in tbe ex- pression of feeling, of passion, even of thought. By various motions and forms of the hand, he expresses: “ What do I care !—Come hither 1—Thie is a rogue I beware of him!—He shall not live long!—• This is a main point!—Observe this well, my bearers!” To such a national pecu- liarity Leonardo, who observed every char- acteristic point with the closest attention, must have turned bis careful eye. In this respect, tbe present picture is unique, and one can scarcely obscrvo it enough. Every look and movement perfectly correspond, and at the same time there is a combined and contrasted position of the limbs, com- prehensiblo at a glance, and wrought out in the most praiseworthy manner. The figures on both sides of the Saviour considered by threes, and each of these again must be thought into a unity, placed in relation, and still held in con- nection with its neighbors. First, on the right side of Christ, are John, Judas, and Peter. Peter the most distant, in conso- nance with bis violent character, when he bears the word of the Lord, hastens up behind Judas, who, looking up affrighted, bcDds forward ovcrtho table,and bolds with his right band firmly closed, the purse, but with the left makes an involuntary nervous movement, as if he would say: What’s that? What does that mean? In the meanwhile Peter has with his left hand seized the right shoulder of John, who is inclined towards him, and points to Christ, and at the same time urges the beloved disciple to ask who tbe traitor is. He strikes a knife bandle, which he holds in bis right hand, inadvertently into tbe ribs of Judas, whereby the affrighted forward movement, which apeete the saltcellar, is happily brought out. This group may be considered as the one which was first thought out by the artist; it is the most perfect. If now upon tbe right hand of the Lord immediate vengeance is threatened, with a moderate degree of motion, there arises upon his left the liveliest horror and detestation of the treachery. James, the elder, bends back from fear, extends bis arms, stares with bis head bowed down as one who sees before him tbe monster which be has just heard of. Thomas peers from behind hie aboulder, and approaching the Saviour, raises the index of his right hand to bis forehead. Philip, the third of this group, rounds it off in tbe loveliest manner; he has risen, bends toward tbe Master, lays his hands upon bis breast, and declares with tbe greatest clearness : Lord, it is not I! Thou knowest it! Thou secst my pure heart. It is not I! And now, the last three figures of this group givo us new material for thought; they talk with one another about the terri- ble thing which they have just heard. Matthew, with a zealous motion, turns his fnco to the left toward his two companions; his bands, on the contrary, be stretches with rapidity towards his master, and thus, by the most ingenious artifice, unites bis own group with the previous one. Thad- deus shows the most violent surprise, doubt and suspicion ; be has laid his left band open upon the table, and has raised the right in a manner as if be intended to strike bis left band with tbe back of tbe right—a movement which one still sees in men of nature when tbey wish to express at an unexpected occurrence: Have I not said so? Have I not always supposed it ? Simon sits at the end of tbe table, full of dignity—we therefore see bis whole figure; he, the eldest of all, is clothed with rich folds; his countenance and movements show that be is astonished and reflecting, not excited, scarcely moved. If we now turn our eyes to the opposite end of tbe table, we see Bartholomew, who stands upon bis right foot, with the left crossed over it; be is supporting bis in- clined body by resting both bands firmly upon the table. He listens, probably to bear what John will find out from tbe Lord; for, in general, tbe incitement of the favorite disciple seems to proceed from this entire side. James, the younger, be- sido and behind Bartholomew, lays his left band upon Peter’s shoulder, juit as Peter lays bis upon the shoulder of John, but James does so mildly, seeking explanation only, whereas Peter already threatens ven- geance. And thus, os Peter reaches behind Judas, so James the younger reaches behind An- drew, who, as one of the most important figures, shows with his half-raised arms, bis expanded bands in front, a decided expression of horror, which appear« only oocc in this picture, while in other works of less genius, and of less profound thought, it recurs unfortunately only too often. Before we now corue to imit&tious of our painting, of which the number amounts to about thirty, we must make some reference to the subject of copies generally. Such did not cornu into use uutil everybody confessed that art had reached its culminating point, whereupon, inferior talents, looking at the works of the greater masters, de*«paired of producing by their own skill anything similar, either in imitation of nature, or from the idea; and art, which now dwindled into more handicraft, began to repeat its own creations. This inability on tho part of most of the artists did not remain a secret to the lovers of art, who, not being able always to turn to the first masters, called upon and paid inferior talents, inasmuch as they preferred, in order not to receive something altogether destitute of skill, to order imitations of recog- nized works, with a view to being well served in some degree. This new procedure was favored, from re&sons of illiberality and overhaste by owners no less than by artists, and art lowered itself advisedly by setting out with the purpose to copy. In the fifteenth century, as well as in the previous one, artists entertained a high idea of themselves and their art, and did not readily conteut themselves with repeating the inventions of others ; hence wc find no real copies dating from that period—a circumstance to which every friend of the history of art will do welt to give heed. Inferior arts no doubt made use of higher patterns for smaller works, as tn the case of Niello and other enamelled work, and, of course, when from religious or other motives, a repetition was desired, people contented themselves with an accurate imitation, which only approximately expressed the movement and action of tho orig- inal, without paying any cloae regard to form and color. Hence in the richest gal- leries we find no copy previous to the sixteenth century. But now came the time, when, through the agency of a few extraordinary men — among whom our Leonardo must be reckoned and considered as the first—art in every one of its parts attained to perfection ; people learned to sec and to judge letter, and now the desire for imitations of first-class work was not difficult to satisfy, particularly in those schools to which large numbers of scholars crowded, and in which the work* of the master were greatly in request. And yet, at that time, this desire was confined to smaller works which could bo easily compared with the original and judged. As regards larger works, the-wftse was quite different at that time from what it was at a later period, because tbe original cannot be compared with the copies, and also because such orders are rare. Thus, then, art, as well as its lovers, contented itself with copies on a small scale, and a great deni of liberty was allowed to the copyist, and the results of this arbitrary proceduro showed themselves, in an overpowering degree, in the few cases in which copies on a large scale were desired. These indeed wore generally copies of oopies. and, what is more, generally executed from copies on a smaller scale, worked out far away from the original, often from mere drawings, or even perhaps from memory. Job-painters now increased by two dozen, and worked for lower prices; people made household ornaments of painting ; taste died out; copies increased and darkened the wails of ante-chumbers and staircases; hungry beginners lived on poor pay, by repeating tho most important works on every scale; yea, many painters passed the whole of their lives in simply copying; but even then an amount of deviation appeared in every copy, either a notion of the person for whom it was painted, or a whim of the painter, or perhaps a presumptuous wish to be original. In addition to this onmo the demand for worked tapestry, in which painting was not content to look dignified, except when tricked out with gold ; and the most magnificent pictures were considered meagre and wretched, because they were grave and simple ; therefore the copyist introduced buildings and landscape in the back ground, orn.iiiiciitfi on the dresses, aureoles or crowns around the heads, and further, strongly formed children, animal, chimeras, grotesques, and other fooleries. It often happened, also, that an artist, who believed in bis own powers of invention, received by the will of a client who could not appreciate his capabilities, a commission to copy another person’s w6rk, and Rince he did so with reluctance, he wished to uppear original here and there, and therefore made changes or additions as knowledge, or perhaps vanity, suggested. Such occurrences took place of course according to the demands of plaoe and time. Many figures were used for purposes quite different from those for which they had been intended by their first producers. Secular subjects were, by means of a few additions, changed into religious ones; heathen gods and heroes bad to submit to be martyrs and evangelists. Often also, the artist, for instruction or exercise to himself, had copied some figure from a cel- ebrated work, and now he added to it some- thing of bis own invention in order to turn it into a saleable picture. Finally, we may certainly ascribe a part of the corruption of art to the discovery and abuse of cop- p*r-plate engravings, which supplied job painters with crowds of foreign inventions, so that no one any longer studied, and painting at last reached such a low ebb that it got mixed up with’ mechanical works. In the first place, the cnpperplate engravings themselves were different from the originals, and whoever copied them multiplied the changes according to bis own or other peoples’ conviction or whim. The same thing happened pi cisely in the case of drawings; artists took sketches of tho most remarkable subjects in Rome and Florence, in order to produce arbitrary repetitions of them when they returned home. In view of the above, we shall be able to judge what is to be expeoted, more or less, of copies of the Supper, although the earliest were executed contemporaneously ; for tho work made a great sensation, and other monasteries desired similar works. Of tho numerous copies consulted by tbe author we shall occupy ourselves here with only three, since the copies at Weimar are taken from them; neverthe- less, at the basis of these lies.a fourth, of which, therefore, we must first speak. Marco d’ Oggiono, a pupil of Leonardo da Vinoi’s, though without any extensive talent, gained the praise of his school cbietly by his beads, although in them he is not always equal to himself. About the year 1510, he executed a copy on a small scale, intending to use it afterwards for n copy on a larger scale. It was, according to tradition, not quite accurate; he made it, however, the basis of a larger copy which is in tbe now suppressed monastery at Castellazzo, likewise in the dining-hall of the monks of those days. Everything about it shows careful work ; nevertheless the usual arbitrariness prevails in the details. And although Vossi has not been able to say much in its pruise, he does not deny that it is a remarkable monument, and that the character of several of the heads, in which the expression is not exaggerated, is deserving of praise. Vossi has copied it, and on comparison of the three copies we shall be able to pronounce judgment upon it from our own observation. A second copy, of which wo likewise have the beads copied before us, is found in fresco on the wall at Ponte Capriasce ; it is referred to the year 1505, and ascribed to Pierro Lovino. Its merits we shall learn in tbe sequel; it has tho peculiarity that the names of tbe figures are written underneath, a pieoe of foresight which aids us in arriving at a correct characterization of the different physiognomies. The gradual destruction of the original wo have described in sufficient detail, and it was already in a very wretched condi- tion when, in 1612, Cardinal Frederico Borromeo, a zealous friend of Art, endeavored to prevent the entire loss of the work, and commissioned a Milanese, Andrea Bianchi, surnamed Vcepino, to cxocuto a full-sized copy. This artist first tried bis skill on a few of the heads; being successful in these, be proceeded and copied the whole of the figures, separately however, and afterwards put them together with the greatest possible care ; the picture is at present to be found in the Ambrueiana library at Milan, and lies mainly at the basis of the most recent copy, executed by Vossi. This whs executed on the following occasion. The Kingdom of Italy was decreed, and Prince Eugene, following the example of Luigi Sforza, wished to glorify the beginning of his reign by patronizing the fine arts. 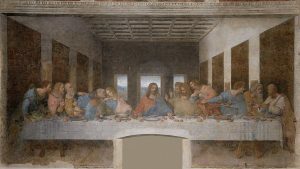 Luigi had ordered a representation of the Last Supper of Leonardo ; Eugène resolved to restore, as far as passible, the painting that bad been going to wreck for three hundred years in a new picture, which, in order that it might be indestructible, was to be done in mosaic, for wbich preparation bad been made in an already existing institution. Vossi immediately receives the commission, and commences in the beginning of May, 1807. lie finds it advisable to execute a full-sized cartoon, takes up anew the studies of his youth, and applies himself entirely to Leonardo, studies bis art-remains and bis writings, particularly tho latter, because he is persuaded that a man who has produced such splendid works must have worked on the most decided and advantageous principles. He had made drawings of ihe heads in the copy at Ponte Capriasca, as well as of some other parts of it, likewise of the heads and hands of the Castellazzo copy, and of that of Bianchi. Then he makes drawings of everything coming from Da Vinci himself, and even of what comes from some of his contemporaries. Moreover he looks about for all the extant copies, and succeeds in making more or less acquaintance with twenty-seven ; drawings and manuscripts of Da Vinci’s are kindlj sent to him from all quarters. In the working out of his cartoon, he adheres principally to the Ambrosinna copy ; it alono is os large as the original. Bianchi, by means of thread-nets and transparent paper, had endeavored to give u most accurate copy of the original, which, although already very much injured, was not yet painted over. In the end of October, 1807, the cartoou is read-; canvass grounded uniformly in one piece, and the whole immediately sketched out. Hereupon, in order in some measure to regulate his tints, Vossi painted the small portion of sky and landscape, which, on account of the depth and purity of the colors in the original, had still remained fresh and brilliant. Hereupon he paints the head of Christ and those of the three apostles at hie left, and as for the drosses, he first paints those about whose colors he bad first arrived at certainly, with a view to selecting the rest according to tho principles of the master and his own taste. Thus he covered the whole of the canvass, guided by careful reflection, and kept his colors of uniform height und strength. Unfortunately, in this damp, deserted place, he was seized with an illness which compelled him to put a stop to bis exertions ; nevertheless, be employed this iuterval in arranging drawing», copper-plate engravings, partly with a view to the Supper itself, partly toother works of the master ; at the samo time he was favored by fortune, which brought him u collection of drawings, purporting to coine from Cardinal Caesar Monti, and containing, among other treasures, remarkable productions of Leonardo bimsclf. He studied even tbe authors contemporaneous with Leonardo, in order to make use of tbeir opinions and wishes, and looked about him for everything that could further his design. Thus be took advantage of his sickness, -and at last attained strength to set about bis work anew. No artist or friend of art will leave unread the account of how ho managed tho details, how he thought out tbe characters of the faces and their expression, and even the motions of tho hands, and how he represented them, lu the same manner he thinks out tbe dishes, the room, the background, nud shows that be has not decided upon any part without the strongest reasous. What care he takes about representing the feet under the table in correct attitudes, because tbis portion of tho original had loog been destroyed, and in the copies bad been carelessly treated! St. Bartholomew, manly youth, sharp profile, compressed, clear face, eyelid and brow pressed down, mouth closed, as if listening with suspicion, a character com pletely circumscribed within itself. In Ves pino’s copy no trace of individual charac teristic features, a general kind of drawing book face, listening with open mouth. Vossi has approved of this opening of the lips, and retained it, a procedure to which we should be unable to lend our assent. St. James the younger, likewise profile, relationship to Christ unmistakable, re ceives from the protruded, slightly opened lips, something individual, which again cancels this similarity. According to Ves pino, almost an ordinary, academical Christ, the mouth opened rather in astonishment than in inquiry. Our assertion that Bar tholomew must have his mouth close, re ceives support from the fact that his neigh bor has his mouth open. Such a repetition Leonardo would never have endured ; on the contrary, the next figure, St. Andrew has his mouth shut. Like persons advanced in life, he presses the lower lip rather against the upper. In the co?j of Marco, this head has something peculiar, not to be expressed in words; the eyes are introverted; the mouth, though shut, is still naive. The outline of the left side against the back ground forms a beautiful silhouette ; enough of the other side of the forehead (eye, nose and beard) is seen to give the head a roundness and a peculiar life; on the contrary, Vespino suppresses the left eye altogether, but shows so much of the left temple and of the side of the beard as to produce in the uplifted face a full bold expression, which is indeed striking, but which would seem more suitable to clenched fists than to open hands stretched forward. Judas locked up within himself, fright ened, looking anxiously up and back, pro file strongly dented, not exaggerated, by no means an ugly formation for good taste would not tolerate any real monster in the proximity of pure and upright men. Vespino, on the other hand, has actually represented such a monster, and it cannot be denied that, regarded by itself, this head has much merit; it expresses vividly a mischievously bold malignity, and would make itself eminently conspicuous in a mob triumphing over an Ecce Homo, and crying out ” Crucify ! crucify !” It might be made to pass for Mephistopheles in his most devilish moment. But of affright or dread, combined with dissimulation, in difference and contempt, there is not a trace ; the bristly hair fits in with the tout ensemble admirably; its exaggeration, however, is matched only by the force and vio lence of the rest of Vespino’s heads. St. Peter. ?Very problematical features. Even in Marco, it is merely an expression of pain; of wrath or menace there is no sign ; there is also a certain anxiety ex pressed, and here Leonardo may not have been at one even with himself ; for cordial sympathy with a beloved master, and threatening against a traitor, are with diffi culty united in one countenance. Never theless, Cardinal Borromeo asserts that he saw such a miracle in his time. How ever pleasant it might be to believe this, we have reason to suppose that the art loving cardinal expressed his own feel ing rather than what was in the picture ; for otherwise we should be unable to de fend our friend Vespino, whose Peter has an unpleasant expression. He looks like a stern Capuchin monk, whose Lent sermon is intended to rouse sinners. It is strange that Vespino has given him bushy hair, since the Peter of Marco shows a beautiful head of short, curled tresses.